Johnston is a head coach who has a firm grasp on the big picture while maintaining a strong hold on the details and that is what this book covers so well – details. Every high school football coach knows that the athleticism and talents of your team will vary from year to year. 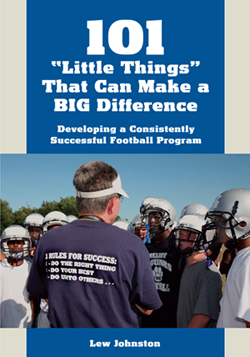 This book provides coaches with information on many little things that can be incorporated into a program and lead to success and the development of a consistently successful football program.